Yes, I have posted Facebook photos of myself with new girlfriends, probably just to make my exes jealous and show off how fabulous and better my life is without them. I wasn’t being consciously mean-spirited, but I knew what I was doing. From Unfriending My Ex (and Other Things I’ll Never Do). It was silly, competitive, and clearly pretentious. I could have avoided all this by cutting Brenda out, unfriending her on Facebook, or unfollowing her on Twitter, but I couldn’t turn away; I wanted that access, just as I’m sure she wanted that access to me. I think we both also forgot how incredibly stupid we looked to our other friends and the rest of the world that was viewing us on social media. All either of us cared about was what the other saw; we were posting for each other. We forgot that others were still reading our posts and judging us. When I got engaged to the woman I’d later marry, naturally, I posted the news on Facebook. Four days later, Brenda posted that she’d gotten engaged. I had assumed our cold war was over. It had been so long that I don’t think we were still tacitly playing the strange digital game, but that coincidence certainly made me think twice. We would never dream of bragging out loud in person, but cloaked as a status update or tweet it’s suddenly all right to self-promote, self-congratulate, and otherwise flaunt every nuance of one’s life. The way we announce our relationships with one another is no exception. When Facebook offered its users the ability to declare their relationship status to their friends, a new sort of silent electronic dagger came into the world. People began to announce that they were “In a Relationship,” “Married,” or the dreaded “Single.” This new rite of passage forces some undeclared couples to have a “state of the union” discussion. I’ve heard some people joke that if the relationship isn’t posted on Facebook, it isn’t happening in real life. And then there are the poor souls who learn about the lives of exes, crushes, or hookup buddies and ache with the grief of unrequited love. The potential for pain is massive. 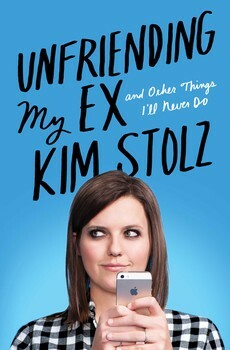 Smart, hilarious, and completely relatable, Unfriending My Ex (And Other Things I’ll Never Do) captures our crazy moment, shining a bright light on the trials and tribulations of life online. Kim Stolz is a former contestant on America’s Next Top Model, MTV news anchor, restaurateur, and current Vice President of Equity Derivatives at Citigroup. She is a graduate of The Brearley School and Wesleyan University. In 2012 she was named one of the 100 Most Compelling People of the Year by Out magazine. She lives in New York City.